Your baby may think that he can’t sleep without a bottle, but it’s wise to break this habit before it becomes too ingrained. In fact, if you put off eliminating a bottle at sleep time, your little one might have even more difficulty separating from this sleep association between months 15 and 18, warns The Sleep Lady. Gently end your baby’s use of a bottle at bedtime to improve his sleep habits. Dilute the contents of the bottle with water gradually over a 1-week period, advises Parenting. Each day, replace approximately 10 to 20 percent of the liquid with plain water to weaken it. Give the bottle to your little one as usual when she asks for it. Each night you give it to her, however, it will contain more water until it contains only water. Allow your baby to have a bottle filled with plain water if he wants it at bedtime or overnight. It’s likely that with just water in the bottle, he will lose his desire for the bottle. Warn your little one ahead of time about stopping the bottle use at bedtime and overnight. Three to 5 days is an appropriate warning time. 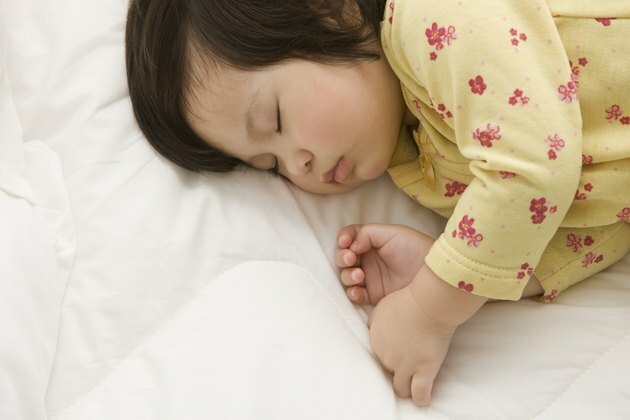 Remind your child several times each day that, in 2 or 3 days, it will be time to sleep without her bottle. Institute a routine that will replace the bottle for your child. This might be snuggling with a lovey or reading special books before bed. Help your child build a positive association with the new routine to help with the future transition. Stop the bottle on the appointed day by proceeding through your bedtime routine and then reminding your little one that this is the day he won’t have a bottle at bedtime. It’s likely that your child will become upset, but strive to remain calm to comfort him. Offer extra snuggles to ease the transition, but remain firm. Expect some fussing during the first few nights after eliminating the bottle, warns Pediatrician Karen Sokai-Gutierrez, writing for the Fisher-Price website. As long as you follow through with the plan consistently, however, your child should accept it after a short time. Remove all bottles from your home after you eliminate them from your child’s bedtime routine to ensure that he does not see them. The American Academy of Pediatrics recommends that parents wean children off a bottle prior to age 18 months. Extended use of a bottle can lead to tooth decay and overconsumption of milk. By age 1, a baby no longer needs to eat or drink during the overnight hours. Fisher-Price: How Can I Wean my Daughter From Her Bottle in Bed? When Can You Stop Giving Your Baby Bottles and Move Strictly to Cups?